Members of Galway Fire Service, An Garda Síochana, the RNLI and Connacht Rugby Academy came together last weekend for a special ‘Super Hero Day’ to meet the children who have been attending the Niall Tomkins Memorial Kids Club, organised by the children’s charity Hand in Hand http://www.handinhand.ie/. Hand in Hand provide much needed services to families in Galway and around the country who have a child going through the trauma of childhood cancer. The Niall Tomkins Memorial Fund raised €52,178.65 this year to help patients and their families who are receiving treatment for cancer and donated €10,000 of this to Hand in Hand. With some of those funds, Hand in Hand have been able to fund a weekly kids club in Niall’s memory which ran during July and August this year for a group of children in Galway who are receiving treatment for cancer. Niall Tomkins was a firefighter from the Claddagh, Galway who sadly passed away in October 2015 after a battle with cancer aged 35 years. Niall spent almost nine months receiving treatment on St. Patrick’s ward in University Hospital Galway (UHG ). During that time Niall’s wife Deirdre often thought how beneficial a family room and other patient comforts would be to patients and their families spending long and difficult days and nights on the oncology/haematology wards. After Niall passed away, Deirdre, Niall’s family, his friends and his colleagues at Galway Fire Service came together to raise funds in Niall’s memory. In August 2016, members of the Galway Fire Service along with Deirdre, Niall’s family and friends cycled over 200km from Galway to Cork and raised a whopping €25,019.82. Then in November 2016, one of Niall’s closest friends, Niall Egan along with a group of Niall’s family and friends organised a very special gala ball in Niall’s memory, very kindly hosted by the g hotel. Between ticket sales, donations, a raffle and an epic auction all so generously supported by so many special donors, friends and sponsors, the Niall Tomkins Gala Ball raised an unbelievable €26,654.49 for the fund. The Niall Tomkins Memorial Fund (NTMF ) has since been able to support a number of very worthy charities. 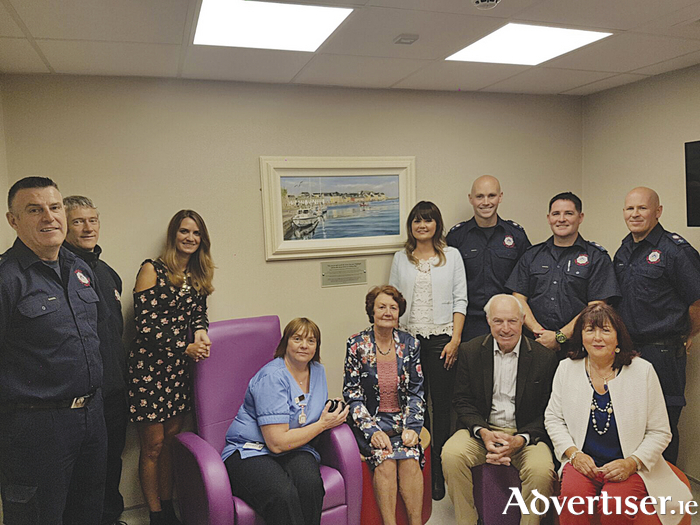 It has part-funded the family room project on the Claddagh Ward, a new ward designated for Haematology patients at UHG. The funds generated by the NTMF have facilitated the provision of a very spacious changing area and shower facilities for families and friends using the family room while caring for loved ones on the ward. The fund has also provided the ward with ten recliner chairs and some chair beds to give families and friends more opportunities to stay close to their loved ones during treatment. These provisions are something Niall’s family did not have access to while Niall was receiving treatment, something they often wished for at that time. The remainder of the NTM funds were allocated to Hand in Hand, Barretstown https://www.barretstown.org/, Make-A-Wish Ireland - https://makeawish.ie/ and to Athenry Cancer Care, Co. Galway - http://athenrycancercare.ie/. The NTMF donated €10,000 to Hand in Hand, €5,000 to Barrettstown, €5,000 to Make a Wish and €1,500 to Athenry Cancer Care. Niall had cancer as a young child and he was one of the first children to attend a camp at Barrettstown when they first started in 1994. The NTM funds will go towards the amazing fun camps Barretstown provide for children who have gone through or are going through the trauma of severe and life threatening illnesses during their young lives. Make a Wish Ireland will designate the donation to fund wishes from children in Galway who have gone through or are going through treatment for cancer. Finally, Athenry Cancer Care are a small cancer care centre who have some very special volunteers and the level of services, support and care they provide free of charge to patients with cancer and their families in a peaceful space in Athenry is second to none. Niall’s wife Deirdre, his parents Mícheál and Bríd and sisters Emer, Olwyn and Ruth wish to express their heartfelt thanks to Galway Fire Service, the Niall Tomkins Memorial Fund committee and all those who have so kindly and generously supported the Niall Tomkins Memorial Fund over the past year. Heroes Rugby league Ireland Health_Medical_Pharma chair childhood cancer treatment for cancer cancer Cancer Care University Hospital Galway g Hotel Deirdre Emer Barretstown RNLI Integrated Mining Ruth Tomkins Commercial Food Services Connacht Rugby Academy Galway Fire Service Gala Ball Mchel Sam Tomkins Niall Tomkins Olwyn http://www.handinhand.ie needed services Memorial Kids Club small cancer http://athenrycancercare.ie Niall Tomkins Memorial Fund Barrettstown www.barretstown.org Athenry Cancer Care Co.